A pressure transmitter in a process control system for transmitting pressure on a process control loop includes a transmitter housing, an isolation diaphragm configured to couple to a process fluid, and a pressure sensor body of a brittle corrosion resistant material operably coupled to the housing and positioned in the housing. The pressure sensor comprising a first portion bonded to a second portion by a fusion bond, the fusion bond substantially free of foreign material. An isolation fluid is configured to fluidically couple the pressure sensor body to the isolation diaphragm to thereby couple the pressure sensor to a pressure of the process fluid. Measurement circuitry in the transmitter housing coupled to the pressure sensor provides an output which is a function of capacitance, a loop interface in the transmitter housing coupled to the measurement circuitry configured to transmit a pressure related signal on the process control loop as a function of the pressure. This application is continuation-in-Part of U.S. patent application Ser. No. 08/818,379, filed Mar. 14, 1997, now U.S. Pat. No. 5,731,522 and to U.S. patent application Ser. No. 09/345,165, filed Jun. 30, 1999, which is a Divisional application of Ser. No. 09/277,249, filed Mar. 26, 1999, which is a Divisional application of Ser. No. 08/807,999, filed Mar. 3, 1997, which is a Continuation application of Ser. No. 08/395,778, filed Feb. 28, 1995, now U.S. Pat. No. 5,637,802. The present invention relates to the process control industry. In particular, the invention relates to a pressure sensor in a pressure transmitter. Pressure transmitters in process applications measure pressure of a process and responsively communicate the information over a two-wire process application loop, for example a 4-20 mA current loop. Pressure sensors in transmitters typically comprise some type of a pressure responsive structure which has a deflectable diaphragm that moves in response to applied pressure. These structures can be used to measure both absolute and differential pressure. As used herein, a differential pressure sensor is a sensor which measures a relatively small pressure differential (such as that generated across an orifice in a flow tube or between two different heights in a fluid filled container) over a relatively wide absolute pressure range. In a typical prior art transmitter, to measure differential pressure, two different pressures are applied to opposing sides of the structure causing a relative deformation in the structure which is measured. Measurement of the deformation, for example, can be by measuring a change in electrical capacitance due to movement of capacitor plates carried on the structure or by change in resistance of a resistive strain gauge. Highly accurate absolute pressure sensors have been desired. However, it has been difficult to obtain an absolute pressure sensor which can deliver an accurate output over a wide pressure range, from 0.4 psi to 4000 psi for example. It would also be desirable to measure differential pressure with two absolute pressure sensors because this is mechanically much simpler than it is to mechanically couple two pressures to a differential pressure sensor. Additionally, an over-pressure in a such a differential pressure sensor can damage the differential pressure sensor. However, it has been difficult to obtain absolute pressure sensors with sufficient accuracy to allow differential pressures in the 0.4 psi to 40 psi range to be measured in a device which must withstand static or line pressure extremes of as much as 4000 psia. For example, 0.01% of 4 psid requires 0.00001% of 4000 psia (10−7 or 0.1 ppm). Typical known pressure sensors used in process applications have unit-to-unit variations in sensitivity to sensed pressure as well as unit-to-unit variations in undesired responses to extraneous parameters such as temperature. This can be a particular problem when the outputs of two absolute or gauge pressure sensors are combined to provide an output representing differential pressure or when the sensor is used over a large pressure range. Additionally, mechanical stress associated with mounting the sensor to the pressure transmitter results in relatively large errors in pressure measurement. FIG. 1 is a cross-sectional view of a pressure transmitter. FIG. 2 is a cut-away perspective view of an insert which carries a pressure sensor. FIG. 3 is a cross-sectional perspective view of a pressure sensor. FIG. 4 is a graph which illustrates operation of the present invention. FIG. 4A is a graph of stress attenuation versus L/W for a pressure sensor. FIG. 5 is a displacement plot of one-quarter of a pressure sensor where l/T equals 1.0. FIG. 6 is a cross sectional view of another embodiment of the pressure sensor. FIG. 7 is a cross-sectional view of a pressure sensor. FIG. 8 is a cross-sectional view of the pressure sensor of FIG. 7. FIG. 9 is a top plan view of a top substrate of the pressure sensor of FIG. 7. FIG. 10 is a top plan view of a bottom substrate of the pressure sensor of FIG. 7. FIG. 11 is a schematic diagram of circuitry for measuring capacitance of a pressure sensor. FIG. 12 is a cross-sectional view of a sensor body. FIG. 13 is a bottom plan view of the sensor body of FIG. 12. FIG. 14 is a cross-sectional view of a sensor body. FIG. 15 is a bottom plan view of the sensor body of FIG. 14. FIGS. 16A through 16G show cross-sectional views of various embodiments of the invention. FIGS. 17A and 17B show two embodiments of capacitor plates. FIG. 18 is a graph of bonding temperature as a percent of melting point temperature versus bonding strength as a percent of material strength. FIG. 19 is a simplified cross-sectional view showing a pressure transmitter including an elongated pressure sensor in accordance with another embodiment. FIG. 1 shows pressure transmitter 50 having transmitter body 52, sensor body 54 and flange 55. Sensor body 54 includes pressure sensors 70A and 70B which measure absolute pressure P1 and absolute pressure P2, respectively, of process fluid. Transmitter body 52 includes transmitter (I/O) circuitry 60 which sends information related to pressures P1 and P2 over a two-wire process control loop, such as a 4-20 mA current to sensors 70A and 70B and receives electrical signals related to pressures P1 and P2. Circuitry on sensor circuit board 58 digitizes and processes these signals, and communicates pressure information to transmitter circuitry 60 using data bus 62. Inserts 67A and 67B carry sensors 70A and 70B. A process barrier 71 forms cavity 75 and prevents pressures P1 and P2 from escaping sensor body 54 should insert 67A or 67B fail. Cavity 75 may be a vacuum or filled with an inert gas. Feed-throughs 73A, 73B and 73C provide electrical pathways across barrier 71 between circuit boards 57 and 58. Optional isolation diaphragms 41A and 41B can be used to isolate the sensors 70A and 70B from the process fluid using optional isolation fluid 43A and 43B which can be an oil as is known in the art. FIG. 2 is a cut-away perspective view of insert 67A which carries sensor 70A. In one embodiment, insert 70A comprises alumina. Additionally, sensor 70A should be small relative to housing 54 and positioned relatively close to sensor 70B to reduce thermal variations and thereby improve accuracy. This is achieved because the thermal time constant of the sensor is significantly less than the thermal time constant of the housing to minimize temperature gradients within the sensing element. FIG. 3 shows sensor 70A in accordance with one embodiment. Sensor 70A includes upper substrate 72 and lower substrate 74 which form cavity 76 therebetween. FIG. 3 shows overall length L, thickness T, width W, minimum cavity width w of the deflecting structure of the sensing cavity and central deflection y due to applied pressure P.
Typical prior art sensors have a ratio of maximum to minimum pressure range which can be accurately sensed of about 100:1. This is primarily limited by non-repeatable errors in the structure and noise. Further, prior art sensors are typically limited by the use of materials with imperfect elasticity, inadequate stress isolation and poor signal-to-noise ratio of the sensing element. For example, metal based pressure sensors have problems with hysteresis, material creep and relaxation. Ceramic based sensors are formed of a matrix of crystals typically bonded with silicon glass and also exhibit these problems. Glass-based sensors are subject to instability due to phase changes and viscosity of the glass. It has been recognized that single crystal materials have superior elastic properties and that sensors based on such materials can have improved accuracy. Single crystal diaphragm sensors have also been used, however they have typically been placed under high tensile stress due to internal pressurization. Additionally, this type of sensor typically includes glass or metal structural elements and uses a low strength bonding material such as glass frit, solder or epoxy. Further, this type of sensor has typically had inadequate stress isolation. Additionally, typical prior art sensors have used an oil fill, such as silicon oil, for use with over-pressure protection mechanisms. The oil fill is also used when coupling a corrosion resistant isolation diaphragm to the pressure sensor. These sensors are subject to failure due to loss of fill fluid. Typical prior art isolating diaphragms have been form formed in metal and are used to keep particles and corrosive materials away from the pressure sensor. These diaphragms must be thin in order to minimize errors, however this makes the diaphragm particularly fragile and limits life of the diaphragm. Further, different diaphragm materials are required for different applications and there is no metal which can be used universally. With the present invention, the isolation fluid is optional. The configuration of the present invention can reduce the fill fluid volume required and therefore improve accuracy. The present disclosure sets forth a pressure sensing structure formed of a single crystal material. Joints in the material are formed using fusion bonding such that they are substantially free of foreign materials which could lead to inaccuracies. The structure may be surrounded by process fluid which applies pressure to the structure. This is possible because the structure is formed of a corrosion resistant material. The brittle material is deformed by compression which provides a higher ratio of working stress-to-error stress and therefore a higher signal-to-noise ratio. This results because brittle materials are stronger in compression than in tension. This configuration causes the sensor to be less sensitive to corrosion of the outer surface because the output is less dependent on the cube of thickness and more closely linearly related to thickness. Placement of the structure in the process fluid improves reliability because the isolation diaphragms and oil fill are eliminated. An elongated shaft provides stress isolation and is formed of the same single crystal material to help reduce errors. Electrical leads are provided through the elongated shaft and isolated from process fluid. A path through the shaft can also be used to apply a reference pressure. In one embodiment, corrosion resistant material such as sapphire is used and an internal sensor is used which allows the oil fill and isolating diaphragms to be eliminated. In one embodiment, matched sensors are used as dual sensors to measure differential pressure, which helps reduce errors common to the two sensors. Capacitance sensing is desirable because it provides a stable, low noise signal. Capacitors have no inherent thermal noise and they have a high gauge factor with a correspondingly high output which minimizes the noise contribution of electronic detection circuitry. They also have excellent zero stability and very low zero temperature coefficients. These factors make it practical to detect the very low pressure changes in a high pressure sensor that are encountered in a differential pressure transmitter based on two independent sensing elements. Improved pressure resolution is achieved by use of electronic circuitry. where w is the effective minimum width of the diaphragm and T is its thickness ( y ∝ W 3 T 2 ) . The sensor output is therefore highly dependent on dimensional variations. This reduces the variation in output versus sensor dimensions but this variation can be further reduced by relying on “bulk” deflection as defined below. where: K 1 = “ bulk ”   deflection   constant   for   material ; K 2 = shear   deflection   constant   for   material ; K 3 = bending   deflection   constant   for   material ; W = sensor   width ; P = external   pressure ; y = central   deflection   of   cavity   76    due   to   applied   pressure   P ; w = width   of   cavity   76 ; T = thickness   at   slot   76   of   sensor   70   ( for   a   square   cross   section ,  T = W / 2 ) ; t = depth   of   cavity   76 ; L = sensor   length   which   is   much   greater     than   sensor   width   W   and   sensor   thickness   T ; E = Young '  s   modulus ;  and    G = shear   modulus . 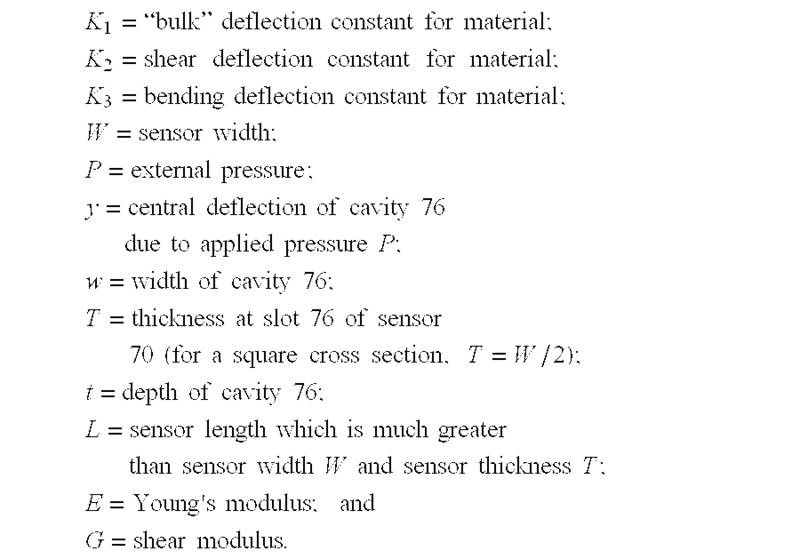 Equation 1 illustrates that shear and bending deflection on cavity 76 are dependent on cavity width w and sensor thickness T.
The term “bulk” deflection as used herein describes the K1P/E component of Equation 1, where y is directly proportional to width w of cavity 76. (y∝w) Therefore, bulk deflection is highly accurate and desirable in determining pressure and is substantially independent of variations in thickness T such as those which occur with corrosion. One aspect of the present invention includes providing a pressure sensor having dimensions such that bulk mode deflection component of total deflection of the sensor is increased. FIG. 4 is a graph of Equation 1 which shows total deflection and its individual components: bulk deflection, shear deflection and bending deflection. When w/T is between 1 and 4, shear deflection predominates total deflection. As w/T gets smaller, the contribution of shear deflection relative to bulk deflection gets smaller. For w/T less than 1.0, bulk deflection is the predominant factor contributing to total deflection of sensor 70A due to applied pressure. Thus, one aspect of the invention includes pressure sensors having a ratio of w (cavity width) divided by T (thickness from an outer surface to an inner surface) of less than or equal to about 1.0. For shear deflection to exceed bending deflection w/T should be less than 4.0. In one embodiment, the ratio of w/T is: 0.05≦w/T≦1.0. The minimum w/T value is determined by how small w can be practically made and inaccuracies due to thermal gradients as T is made large. It is desirable to minimize tensile stresses in sensors made of brittle materials because this reduces the possibility of failure due to cracking of the sensor. One aspect of the invention includes surrounding the sensor with the measured pressure and suitably dimensioning the sensor such that the hydrostatic compressive stress can be made to exceed the tensile bending stresses. Since the stresses are generally additive, the entire structure can be kept in compression. This occurs when w/T is less than about 2.3. Stress isolation of sensor 70A is also achieved. Stress due to mounting sensor 70A to housing 54 causes a force to be exerted on the sensor (in addition to the force due to applied pressure) and introduces an error into pressure measurements. The elongated structure reduces the effects of mounting stress to provide accurate measurement of differential pressures and a wide operating span. Generally, mounting stress attenuates distal to the mount as sensor length L increases. Any mounting stress errors must be sufficiently attenuated over length L to achieve the desired pressure error. FIG. 4A is a graph which shows a relationship between stress attenuation and L/W for the sensor of FIG. 3. The vertical axis of FIG. 4A shows the ratio of the stress at the mounting point (σMOUNT) to the measured stress due to the mounting stress (σMEASURED). A change in the mounting stress (ΔσMOUNT) causes an error in the pressure measurement due to the change in mounting stress at the pressure sensor (ΔσMEASURED). In one embodiment, a 0.01% accuracy is required such that when measuring a pressure of 4 psi the error due to mounting stress must be less than 4×10−4 psi. A typical ΔσMOUNT value is 400 psi such that the attenuation of the mounting stress must be 4×10−4 psi/by 400 psi=10−6. As shown in FIG. 4A, this occurs at approximately L/W of 4. In an embodiment in which two sensors are used for differential pressure measurement and they are matched within 10% accuracy, σMESURED/σMOUNT reduced by a factor 10 such that L/W is approximately 3. In one embodiment, L/W is between 3 and 5. FIG. 5 is a cross-sectional view showing a displacement plot for sensor 70A. FIG. 5 shows one-quarter of the cross section of sensor 70A. In FIG. 5, sensor thickness T is approximately equal to cavity width w. An applied pressure P of 4500 psi displaces sensor 70A. In FIG. 5, about half the deflection is due to shear tension and about half is due to “bulk” deflection. This is shown in FIG. 4 where shear and bulk deflection meet. If sensor 70 were entirely in bulk mode compression, sensor 70 would retain its rectangular shape as pressure was applied. The shape distortion is due primarily to shear deflection. FIG. 6 is a cross sectional view of sensor 120 including elongated portion 122 and end portion 124 which form cavity 125 having width w. In one embodiment, cavity 125 is square. Dimensions T, W and L are also shown in FIG. 6 carries capacitive plate 128 which forms a capacitor with plate 126 carried on portion 122. Conductors 130 and 132 connect to plate 126 and 128, respectively. Pressure P causes cavity 125 to deform, thereby changing the capacitance between plates 126 and 128. FIG. 7 is a cross-sectional view of pressure sensor 200. Pressure sensor 200 includes top substrate 202 and lower substrate 204. Via hole 203 extends through substrate 202 for coupling to electrical conductors in cavity 205. FIG. 8 shows top guard conductor 210, top capacitor conductor 212, top guard conductor 214, bottom guard conductor 216, bottom capacitor conductor 218 and bottom guard conductor 220. FIG. 9 is a top plan view of substrate 202 in which electrical conductors on the under side of substrate 202 are visible therethrough. FIG. 9 shows capacitor plate 222 connected to conductor 212 and surrounded by guard 224 which connects to conductors 214 and 210. FIG. 9 also shows vias 203 and 226 which extend through substrate 202 to conductors 210 and 212, respectively. FIG. 10 is a top plan view of bottom substrate 204 in which electrical conductors carried on the underside of substrate 204 are visible therethrough. In the example, substrate 204 is sapphire. FIG. 10 shows capacitor plate 228 which capacitively interacts with capacitor plate 222. Plate 228 is surrounded by electrical guard 230 and temperature sensor 232. Guard 230 shields plate 228 from stray capacitance and temperature probe 232 changes resistance based upon temperature. This provides temperature measurement of sensor 200, and allows compensation of pressure measurements based upon temperature for increased accuracy. Bonding is preferably fusion bonding, also known as direct fusion bonding, or wafer bonding in which flat, polished surfaces are mated and are bonded with the application of heat. Etching is with POCl3 gas at 900 to 1100° C. with an SiO2 mask. It is desirable to align the crystal structure of the substrates such that the resulting crystal structure is substantially continuous after bonding. Further, the fusion bond should be made at a temperature as close as possible to the melting point. For this reason, the electrode material should be capable of withstanding the high fusion bond temperatures. For example, chrome, tungsten, tantalum, platinum and iridium allow bond temperatures in the 1300° C. to 1700° C. range so that bond strength is maximized and healing of discontinuities in the crystal can occur. A typical bonding time is one hour. Other conductors include metal suicides such as molybdenum silicide. In a differential pressure transmitter, a temperature difference between the two sensors will cause an error. Acceptable performance will require that the difference be less than about 1° F. and that the difference be measured to a precision of better than about 0.1° F. and compensated. In a typical application, this will require that the sensor spacing be less than 0.5 inches. A temperature gradient within a sensing element will also cause an error. Acceptable performance will require that the temperature difference between the inside and outside of the sensor be less than about 0.001° F. and that the sensors be closely matched. A sensor width or thickness of greater than about 0.25 inches will place unreasonable demands on sensor matching in a typical application. CI should be selected to be approximately equal to (C1-C2)/2 at maximum differential pressure, for example, 1 pF. Additionally, to compensate for manufacturing variations, it is desirable to have separate gain adjustments for each sensor. Additionally, circuitry should be included to measure C1, C2 or C1+C2, independently, in order to compensate for variations in output due to common mode or line pressure. Circuitry for detecting capacitance output is set forth in U.S. Pat. No. 5,083,091, entitled “Charge Balanced Feedback Measurement Circuit,” commonly assigned with the present application. The output from converter 260 is provided to interface circuitry 262. Interface 262 is connected to a 4-20 mA current loop and provides the digital signal from A/D converter 260 to current loop 264 in either a digital or analog format. Interface 262 also provides power to circuitry 250 from loop 264. Interface 262 is also capable of receiving commands, such as those pursuant to the HART® communications standard. FIGS. 12 and 13 show another embodiment having sensor body 300 which carries pressure sensors 200A and 200B. FIG. 12 is a side cross-sectional view of sensor body 300 and FIG. 13 is a bottom plan view of body 300. Body 300 includes circuit boards 57 and 58 connected by wires through feed-throughs 73A, 73B and 73C through process barrier 71. Sensors 200A and 200B are carried in alumina insert 302. Process barrier 71 forms chamber 75 which may be a vacuum or filled with an inert gas. A groove 304 extends around alumina insert 302 and provides thermal and stress isolation. Mounting holes 306 are used to couple body 300 to a conduit (not shown). In another embodiment, a bond between the sensor and the transmitter body is a fusion bond. FIGS. 14 and 15 show sensor body 310 including middle shell 312 which carries alumina insert 314. Sensors 200A and 200B are seated in alumina insert 314 which also carries ASIC chip 316. ASIC chip 316 performs the same functions as circuit board 57. Groove 318 provides stress isolation for insert 314 and sensors 200A and 200B. Process barrier 320 seals shell 312 and provides a second barrier to process fluid. Cavity 322 in shell 312 may carry a vacuum or inert gas. Feed-throughs 324 provide a path for electric connections from ASIC chip 316 to circuit board 326. The design shown in FIG. 3 allows the sensor assembly to be tested prior to welding shell 312 into sensor body 310. High temperature operations (such as brazing the sensor to the alumina insert) can be conducted before mounting the sensor assembly in the housing. A typical capacitance for the sensor is 42 pF at zero psi. FIGS. 16A through 16G show cross-sections of a pressure sensor in accordance with one aspect of the invention. FIG. 16A shows a rectangular structure in which all interior angles are 90°. FIG. 16B shows a hexagonal sensor structure in which all interior angles are 60°. A rhombus structure is shown in FIG. 16C in which two inner angles are 60° and two angles are 30°. FIG. 16D shows a triangular structure in which all interior angles are 60°. The structures shown in FIGS. 16A through 16D are convenient structures for sapphire because they tend to lie along planes of a sapphire crystal. FIG. 16E shows a sensor 340 in which a rounded portion 342 is coupled to a rectangular portion 344. Cavity 346 is formed in rectangular portion 344. FIG. 16F shows another embodiment in which the cavity is formed in the rounded portion. Various alternatives are also available including rounding both portions, such as shown in FIG. 16G. A round cross section is desirable because it can be closely fit into a round hole and can be sealed with a round O-ring. It can be fabricated by machining a square structure with a diamond grinding wheel. FIGS. 17A through 17B show example configurations of the electrodes for capacitive plates. Electrode instability causes errors in capacitive pressure sensors which have small gaps. Residual stress causes the pressure sensor structure to warp. Further, dimensional changes in the electrode surface change the gap dimension t. These changes can be caused by oxidation and reduction or migration of atoms on the opposing surfaces. FIGS. 17A and 17B show examples of a solution to this problem in which the capacitor plates are broken apart into strips having widths and spacings which result in a capacitance that is substantially equal to a solid electrode. For example, if the substrate has a dielectric constant of 10 times the gap dielectric constant, then the spacings could be about 10 times the gap dimension and the widths could be less than about the gap dimension. This reduces the amount of material available to warp the sensor structure. Further, the strips can be configured so that most of the electrical flux emerges from the back side of the electrodes. As the back side of the electrode is in contact with sapphire, it is protected from surface effects and will provide a stable capacitance even if the inside surface changes dimensions. FIGS. 17A and 17B show two example configurations which increase the amount of flux emanating from the back side of the electrodes. Variations on this embodiment include providing guard electrodes (298) which overlie each plate electrode and shield each plate electrode. Although these plates are spaced apart, they are similar to a continuous capacitor plate because of their spacing and relative size. In one embodiment, the capacitor electrodes are implanted into the surface of the substrate. This provides electrode stability by protecting the electrode and helping to reduce the amount of the change in the capacitance over time. A sapphire substrate is implanted with V ions at a dose of 1×1018 ions/cm2 and an energy level of 200 KeV. This changes the resistivity of the sapphire from very highly resistant to about 15 Ohms/sq. The implanting process concentrates most of the V approximately 1000 Å beneath the original sapphire surface. An example of an implanted electrode 300 is shown in phantom in FIG. 17B. FIG. 18 is a graph of bonding temperature as a percent of melting point temperature versus bond strength as a percent of material strength. For maximum stability and accuracy, it is desirable to have the bond strength as close as possible to the material strength so that the sensor structure behaves as a unitary body. In one embodiment of the invention, bonding temperature is the range indicated at 350 in FIG. 18. Sapphire, quartz or silicon can be used in forming a pressure sensor, and their melting points are 2050° C., 1723° C. and 1415° C., respectively. The desired range 350 shown in FIG. 18 is from a temperature of about 68% of the melting point absolute temperature. In one embodiment, bonding temperature should not exceed about 95% of the melting point temperature. The desired fusion bond as used herein is a bond having a strength which is substantially the same as the strength of the underlying crystal material, and is formed by the application of heat with substantially no foreign material in the bond. FIG. 19 is a cross-sectional view of transmitter 50 of FIG. 1 which illustrates another aspect of the present invention. Elements in FIG. 19 which are similar to elements in FIG. 1 have retained their numbering. Transmitter 50 of FIG. 19 includes two pressure sensor cells 400A and 400B which each include an elongate fusion bonded pressure sensor 402A and 402B, respectively, in accordance with the techniques set forth herein. The mounting of sensors 402A and 402B can be in a manner to reduce stress from external sources which could cause inaccuracies in pressure measurements. Sensors 402 can be coupled to cells 400 with a braze, for example, of gold-germanium. Cells 400A and 400B couple to process pressures P2 and Pi through capillary tubing 404A and 404B, respectively. Capillary tubing 406A and 406B contains isolation fluid 406A and 406B which is isolated from process fluid 408 by isolation diaphragms 410A and 410B, respectively. Isolation diaphragms 410 and isolation fluid 406 are used to isolate pressure sensors 402 from process fluid 408. The pressure exerted by process fluid 408 causes diaphragms 410 to deflect. This pressure change is conveyed to process fluid 406 and conducted to pressure sensors 402. Typically, isolation diaphragms 410 are of a corrosion resistant material and isolation fluid 106 is a substantially incompressible fluid. Such diaphragm/isolation fluid configurations are known in the art. In such an embodiment, the sensor 402 does not need to be corrosion resistant. Pressure sensor cell 400B is shown in cross-sectional. Sensor cell 400A can be constructed in a similar manner. Cell 400B includes a pressure cavity 412B formed therein for receiving pressure sensor 402B. Pressure cavity 412B is filled with the isolation fluid 406B. The isolation fluid 406B provides fluidic coupling between sensor 402B and isolation diaphragm 410B. Further, the isolation diaphragm provides pressure coupling, through the isolation fluid 406, of pressure from process fluid 408 to the pressure sensor 402B. In one aspect, a thermal compensation member can be provided such as a low coefficient of expansion collar placed in cavity 412B. Preferably, the volume of isolation fluid 406 including the volume formed by capillary tubing 404B and cavity 412B are minimized. This is to reduce the effects of thermal expansion or contraction of fill fluid 406 on the pressure measurements obtained by pressure sensors 402B. Additionally, a thermal expansion collar can have an expansion coefficient selected to operate in a manner which counteracts the expansion of the fill fluid 406. The collar should have a coefficient of expansion which compensates for dimensional variations of other components which could alter the pressure measurements obtained by sensor 402B. For example, the collar can comprise a material having a lower coefficient of expansion than the material used to make up cell 400, which may comprise stainless steel. In such an embodiment, the collar can comprise a ceramic such as cordierite available from, for example, Superior Technical Ceramics of St. Albens, Vt or Coors Ceramic Company of Golden, Colorado. Such a configuration is described in U.S. Pat. No. 5,731,522, which issued Mar. 24, 1998 to Fred C. Sittler and is entitled TRANSMITTER WITH ISOLATION ASSEMBLY FOR PRESSURE SENSOR and which is incorporated herein by reference in its entirety. In the embodiment of FIG. 19, sensors 402A and 402B are shown as coupling to a sensor circuit board 58 through conductors 416A and 416B, respectively. Typically, conductors 416A and 416B comprise multiple individual connections for coupling to capacitive plates in sensors 402A and 402B and any other electrical components of sensors 402A and 402B such as for use in electrical grounding or temperature measurements. The embodiment of FIG. 19 shows a configuration with two separate pressure sensors which is useful in obtaining two separate pressures, P1 and P2. These pressures can be used to obtain a differential pressure (P1-P2). However, the particular configuration can be selected as desired and pressures can be used individually. Additionally, the transmitter 50 can use the pressure measurement for any possible configuration including the determination of other process variables such as flow or level. Although the present invention has been described with reference to preferred embodiments, workers skilled in the art will recognize that changes may be made in form and detail without departing from the spirit and scope of the invention. Single crystal materials include sapphire, silicon, quartz, ruby and diamond. Generally, these are materials with low hysteresis which are highly stable thereby providing little creep. In general, materials with higher melting points will be more stable thus, sapphire is one preferred material. The cavity of the sensor can be a vacuum or filled with a fluid or gas. The electrodes can include conductors such as metals, metal oxides or doped semiconductors and can be protected with an insulating dielectric material such as quartz. In another embodiment, the stress isolation structure is formed of a polycrystalline material. Further, the bonding can be formed with or without the use of pressure. a loop interface in the transmitter housing coupled to the measurement circuitry configured to transmit a pressure related signal on the process control loop as a function of the capacitance. 2. The pressure transmitter of claim 1 wherein the process control loop is configured to carry a 4-20 mA signal. 3. The pressure transmitter of claim 2 wherein the 4-20 mA signal is related to the applied pressure. 4. The pressure transmitter of claim 1 wherein the pressure related signal comprises a digital signal. 5. The pressure transmitter of claim 1 wherein the pressure within the cavity is substantially a vacuum. 6. The pressure transmitter of claim 1 wherein pressure within the cavity comprises a reference pressure. 7. The pressure transmitter of claim 1 wherein the material comprises sapphire. 8. The pressure transmitter of claim 1 wherein the material comprises single crystal material. 9. The pressure transmitter of claim 1 wherein the material comprises single crystal sapphire. 10. The pressure transmitter of claim 1 wherein the fusion bond is formed by applying pressure to the body. 11. The pressure transmitter of claim 1 wherein the fusion bond is formed without applying pressure to the body. 12. The pressure transmitter of claim 1 wherein the brittle material comprises silicon. 13. The pressure transmitter of claim 1 herein the brittle material comprises ruby. 14. The pressure transmitter of claim 1 wherein the brittle material comprises quartz. 15. The pressure transmitter of claim 1 wherein the brittle material comprises diamond. 16. The pressure transmitter of claim 1 wherein at least one electrode comprises a metal oxide. 17. The pressure transmitter of claim 1 wherein at least one electrode comprises a doped semiconductor. 18. The pressure transmitter of claim 1 wherein at least one electrode comprises a metal. 19. The pressure transmitter of claim 18 wherein the metal comprises chrome. 20. The pressure transmitter of claim 18 wherein the metal comprises tungsten. 21. The pressure transmitter of claim 18 wherein the metal comprises tantalum. 22. The pressure transmitter of claim 18 wherein the metal comprises platinum. 23. The pressure transmitter of claim 18 wherein the metal comprises iridium. 24. The pressure transmitter of claim 1 wherein at least one plate comprises a metal silicide. 25. The pressure transmitter of claim 1 wherein at least one capacitive plate is implanted into a surface of the body. 26. The pressure transmitter of claim 1 wherein the interface is further configured to receive commands from the process control loop. 27. The pressure transmitter of claim 1 wherein the pressure sensor body comprises a corrosion resistant material. 28. The pressure transmitter of claim 1 wherein the sensor body comprises an elongate structure. 29. The pressure transmitter of claim 1 wherein at least one outer edge of the pressure sensor body is substantially straight. 30. The pressure transmitter of claim 1 wherein at least one outer surface of the pressure sensor body is substantially flat. 31. The pressure transmitter of claim 30 wherein all outer surfaces of the pressure sensor body are substantially flat. 32. The pressure transmitter of claim 1 wherein the cavity has at least two opposed substantially flat interior surfaces. 33. The pressure transmitter of claim 32 wherein the first and second capacitive plates are position on the opposed substantially flat surfaces. 34. The pressure transmitter of claim 1 wherein the pressure sensor body couples to the transmitter housing through a stress isolation member. 35. The pressure transmitter of claim 1 wherein the transmitter housing includes a sensor carrying member configured to carry the pressure sensor body and an ASIC chip. 36. The pressure transmitter of claim 35 wherein the ASIC compensates the capacitance. 37. The pressure transmitter of claim 1 including a temperature sensor thermally coupled to the pressure sensor body and wherein the pressure related signal from the loop interface is further a function of an output from the temperature sensor. 38. The pressure transmitter of claim 37 wherein the temperature sensor is fabricated on the pressure sensor body. 39. The pressure transmitter of claim 38 wherein the temperature sensor has a resistance which is a function of temperature. 40. The pressure transmitter of claim 1 wherein the fusion bond is formed through application of heat. 41. This pressure transmitter of claim 1 wherein the fusion bond is formed through application of pressure. 42. The pressure transmitter of claim 1 including a pressure cell configured to carry the pressure sensor body and wherein the pressure cell includes a cavity formed therein configured to receive a pressure related to the process pressure. 43. The pressure transmitter of claim 42 including an isolation diaphragm configured to isolate the cavity of the pressure cell from the process fluid. 44. The pressure transmitter of claim 43 including an isolation fluid carried in the cavity and coupling the cavity to the isolation diaphragm. 45. The pressure transmitter of claim 44 including a thermal compensation member in the cavity of the pressure cell, the thermal compensation member having a thermal expansion coefficient configured to compensate for changes in dimensions to thereby reduce thermal sensitivity of the pressure transmitter. 46. The pressure transmitter of claim 45 wherein the thermal compensation member comprises cordierite. 47. The pressure transmitter of claim 45 wherein the pressure cell has a first thermal expansion coefficient and the thermal compensation member has a second thermal expansion coefficient and wherein the second thermal expansion coefficient is less than the first thermal expansion coefficient. 48. The pressure transmitter of claim 42 wherein the pressure sensor body includes a portion which extends from the pressure cell. 49. The pressure transmitter of claim 42 wherein the pressure sensor body is coupled to the pressure cell through a braze. 50. The pressure transmitter of claim 1 including a second pressure sensor body having capacitive plates associated with a cavity formed therein, the cavity having at least one dimension responsive to a second pressure. 51. The pressure transmitter of claim 50 wherein the measurement circuitry is configured to provide an output related to a differential pressure determined as a difference between the pressure of the process fluid and the second pressure. 52. The pressure transmitter of claim 50 wherein the second pressure is related to a second pressure of the process fluid. 53. The pressure transmitter of claim 1 wherein the isolation fluid comprises oil. DE1648764U (en) 1952-10-06 1952-12-31 Agnes Speer Schnelleinfaedler for sewing machines, sewing and darning needles. "A Balanced Resonant Pressure Sensor", E. Stemme and G. Stemme, Sensors and Actuators, A21-A23, 1990, pp. 336-341. No mo. "A Cold High-Vacuum Seal Without Gaskets", by L. Macebo, University of California Lawrence Radiation Laboratory, (Sep. 1, 1962), pp. 1-11. "A Model for the Silicon Wafer Bonding Process", by R. Stengl et al., Japanese Journal of Applied Physics, vol. 28, No. 10, (Oct. 1989), pp. 1735 &1741. "A Model for the Silicon Wafer Bonding Process", by. R. Stengl et al., Japanese Journal on Applied Physics, (Oct. 1989); pp. 1735-1741. "A New Type of High Performance Device for VLSI Digital System", by X. Xiao-Li et al., Solid State Devices, (1988), pp. 579-582. No mo. "A Small and Stable Continuous Gas Laser", by H.G. Van Bueren et al., Physics Letters vol. 2, No. 7, (Nov. 1962), 2 pgs. "A Stress and Temperature Compensated Orientation and Propagation Direction for Surface Acoustic Wave Devices", by B. Sinha, IEEE Transactions on Ultrasonics, Ferroelectrics, and Frequency Control, vol. UFFC-34, No. 1, (Jan. 1987), pp. 64-74. "Analysis and Design of a Four-Terminal Silicon Pressure Sensor at the Centre of a Diaphragm", by M. Bao et al, Sensors and Actuators, (1987), pp. 49-56. No mo. "Boundary Migration of Single Crystal in Polycrystalline Alumina", by M. Kinoshita, Journal of the Ceramic Society of Japan, vol. 82, No. 945, (1974), pp. 295-296. No mo. "Bubble-Free Silicon Wafer Bonding in a Non-Cleanroom Environment", by R. Stengl et al., Department of Mechanical Engineering and Materials Science, Duke University, (1988) p. L2364. No mo. "Chemical Free Room Temperature Wafer to Wafer Direct Bonding", by S. Farrens et al., J. Electrochem. Soc., vol. 142, No. 11, (Nov. 1985), pp. 3949-3955. "Closure and Repropogation of Healed Cracks in Silicate Glass", by T. Michalske et al., Journal of the American Ceramic Society, vol., 68, No. 11, (Nov. 1985), 3 pgs. "Creep of Sensor's Elastic Elements: Metals versus Non-metals", K. Bethe, D. Baumgarten and J. Frank, NOVA SENSOR -Silicon Sensors and Microstructure, 1990, pp. 844-849. No month. "Development of a High Temperature Capacitive Pressure Transducer", by R.L. Egger, NASA CR-135282 (Oct. 1977)., pp. 1-114. "Diffusion Bonding of Ceramics", by C. Scott et al., American Ceramic Society Bulletin, (Aug. 1985), pp. 1129-1131. "Diffusionsschweissen Optischer Bauelemente Aus Quarzglas", by K. Veb et al., Schweisstechnik, Berlin, (1983), pp. 262-264. No mo. "Direct Bonding in Patent Literature", by J. Haisma, Philips J. Res., (1995), pp. 165-170. No mo. "Direct Bonding of Ceramics and Metals by Means of a Surface Activation Method in Ultrahigh Vacuum", by T. Suga et al., Proceedings of the MRS International Meeting on Advanced Materials, vol. 8, (Jun. 1988), pp. 257-263. "Diversity and Feasibility of Direct Bonding: A Survey of a Dedicated Optical Technology", by J. Haisma et al., Applied Optics, vol. 33, No. 7, (Mar. 1994), pp. 1154-1169. "Effect of Scale and Time Factors on the Mechanical Strength of an Optical Contact", by S.S. Kachkin et al., Sov. J. Opt. Technol., vol. 56, No. 2, (Feb. 1989), pp. 110-112. "Fabrication of an Implantable Capacitive Type Pressure Sensor", S. Shoji, T. Nisase, M. Esashi and T. Matsuo, Transducers '87, 1987. No mo. "High Pressure Sensors", Instrument Engineers Handbook vol. 1, Process Measurements, B. Liptak, Editor, pp. 244-245. No date. "High Temperature Pressure Transducer", Techlink Industry, Techlink No. 2359, (1978), 2 pgs. No mo. "High-Temperature Healing of Lithographically Introduced Cracks in Sapphire", J. Rödel and A.M. Glaeser, J. Am. Ceram. Soc., vol. 73, No. 3, Mar. 1990, pp. 592-601. "Interface charge control of directly bonded silicon structures", S. Bengtsson and O. Engström, J. Appl. Phys., vol. 66, No. 3, Aug. 1, 1989, pp. 1231-1239. "Le Poli Optique, Element De La Construction Des Tubes A Vide (')", by P. Danzin et al., Annales De Radioelectricite, (Jan. 1948), pp. 281-289. "Low-Cost High-Sensitivity Integrated Pressure and Temperature Sensor", by P. Pons et al., Sensors and Actuators, (1994), pp. 398-401. No mo. "Low-Temperature Characteristics of the Transducer", Rev. Sci. Instrum., vol. 56, No. 6, (Jun. 1985), pp. 1237-1238. "Low-Temperature Preparation of Silicon/Silicon Interface by the Silicon-to-Silicon Direct Bonding Method", by S. Bengtsson et al., J. Electrochem. Soc., vol. 137, No. 7, (Jul. 1990), pp. 2297-2303. "Metrological Characteristics for Sapfir-22D Pressure Sensors", by A.M. Evtyushenkov et al., Plenum Publishing Corporation, (1989), pp. 147-150. No mo. "Morphological Evolution of Pore Channels in Alumina", by J. Rodel et al., Ceramic Transactions -Sintering of Advanced Ceramics, vol. 7, (May 1988), pp. 243-257. "New Techniques for Fusion Bonding and Replication for Large Glass Reflectors", by J.R. Angel, Steward Observatory, University of Arizona, pp. 52-56. No date. "Nonlinear Analyses on CMOS Integrated Silicon Pressure Sensors", by K. Suzuki et al., IEEE, (1985), pp. 137-140. No mo. "Optical-Contact Bonding Strength of Glass Components", by S.S. Kachkin et al., Sov. J. Opt. Technol., vol. 47, No. 3, (Mar. 1980), pp. 159-161. "Phase Formation Study in alpha-Al2O3 Implanted With Niobium Ions", by L. Romana, P. Thevenard, B. Canut, G. Massouras and R. Brenier, Nuclear Instruments and Methods in Physics Research B46, published by Elsevier Science Publishers B.V. (North-Holland), pp. 94-97 (1990). No mo. "Phase Formation Study in α-Al2O3 Implanted With Niobium Ions", by L. Romana, P. Thevenard, B. Canut, G. Massouras and R. Brenier, Nuclear Instruments and Methods in Physics Research B46, published by Elsevier Science Publishers B.V. (North-Holland), pp. 94-97 (1990). No mo. "Pressure and Temperature Measurements with Saw Sensors", by D. Hauden et al., 36th Annual Frequency Control Symposium, (1982), pp. 284-289. No mo. "Pressure Sensitivity in Anisotropically Etched Thin-Diaphragm Pressure Sensors", by S. Clark et al., IEEE Transactions on Electron Devices, vol. Ed-26, No. 12, (Dec. 1979), pp. 1887-1896. "Production of Controlled-Morphology Pore Arrays: Implications and Opportunities", J. Rödel and A.M. Glaeser, J. Am. Ceram. Soc., vol. 70, No. 8, Aug. 1987, pp. C-172 -C-175. "Quartz Capsule Pressure Transducer for the Automotive Industry", by D.Y. Lee et al., SAE Technical Paper Series Society of Automotive Engineers, Inc., (Feb. 1981), 6 pgs. "Sapphire Transducer Works Under Pressure," Machine Design, vol. 59, No. 3, Feb. 12, 1987, p. 72. "Silicon Fusion Bonding For Pressure Sensors", by K. Petersen et al., IEEE, (1988), pp. 146-147. No mo. "Silicon Microcavities Fabricated with a New Technique", L. Tenerz and B. Hök, Electronics Letters, vol. 22, No. 11, May 22, 1986, pp. 615-616. "Silicon on Sapphire: The Key Technology for High-Temperature Piezoresistive Pressure Transducers", by H.W. Keller et al., Transducers, (1987), 4 pgs. No mo. "Silicon Sensors and Microstructure", J. Brysek, K. Petersen, J. Mallon, Jr., L. Christel, F. Pourahmadi, NOVA SENSOR, Jun. 1990, pp. 5.4-5.8, 8.21-8.23, 9.9-9.10, 9.13-9.15. "Silicon-On-Insulator Wafer Bonding-Wafer Thinning Technological Evaluations", by J. Haisma et al., Japanese Journal of Applied Physics, vol. 28, No. 8, (Aug. 1989), 4 pgs. "Silicon-on-Sapphire Pressure Sensor", by C. Qinggui et al., Transducers, (1987), 4 pgs. "Silicon-To-Silicon Direct Bonding Method", by M. Shimbo et al., Journal of Applied Physics, vol. 60, No. 8, (Oct. 1986), pp. 2987-2989. "Small sensitive pressure transducer for use at low temperature", W. Griffioen and G. Frossati, Rev. Sci. Instrum., vol. 56, No. 6, Jun. 1985, pp. 1236-1238. "Special Issue on Direct Bonding", by J. Haisma et al., Philips Journal of Research, vol. 49, No. 1/2, (1995), pp. 1-182. No mo. "Spectroscopic Study of the Surfaces of Glass Joined by Optical Contact", by V.M. Zolotarev et al., Sov. J. Opt. Technol., (Jun. 1977), pp. 379-380. "Strength of Glass Ceramic S0115M and its Joints Based on Optical Contact", by A.I. Busel et al, Plenum Publishing Corporation, (1983), p. 378. No mo. "Structure and Morphology of the Reaction Fronts During the Formation of MgAl2O4 Thin Films by Solid State Reaction Between R-cut Sapphire Substrates and MgO Films", by D. Hesse et al., Interface Science, (1994) pp. 221-237. No mo. "Study of the Stressed State of a Sintered Quartz Monoblock", by Y. Lisitsyn et al., Plenum Publishing Corporation, (1986), pp. 643-645. No mo. "Surface electrical properties of Ni-implanted sapphire", by L. Shipu, F. Donghui, X. Ning, S. Zhenya and C. Xiaoming, Processing of Advanced Materials, published by Chapman & Hall, pp. 77-80 (1991). No mo. "The Joining of Ceramics", by A.S. Bahrani, Int. J. for the Joining of Materials, vol. 4, No. 1 (1992), pp. 13-19. No month. "Transient Response of Capacitive Pressure Sensors", by P. Pons et al., Sensors and Actuators, (1992) pp. 616-621. No mo. "Use of Strain Gauges with a Silicon-On-Sapphire Structure for Thermophysical Experiments", by V.F. Kukarin et al., Plenum Publishing Corporation, (1986) pp. 1085-1087. No mo. "Wafer bonding for silicon-on-insulator technologies", J.B. Lasky, Appl. Phys Lett., vol. 48, No. 1, Jan. 1, 1986, pp. 78-80. "Wafer Bonding For SOI", by W.P. Maszara et al., Mat. Res. Soc. Symp. Proc.. vol. 107, (1988), 2 pgs. No mo. "Why Nanoparticles Are So Big", Chemical Engineering, pp. 37, 39 and 41, (Apr. 1990). Silicon-On-Insulator by Wafer Bonding and Etch-Back, by W.P. Maszara et al., 1988 IEEE SOS/SOI Technology Workshop, Oct. 3-5, 1988. U.S. patent application Ser. No. 09/477,689, Sittler, filed Jan. 6, 2000. U.S. patent application Ser. No. 09/478,383, Lutz et al., filed Jan. 6, 2000. U.S. patent application Ser. No. 09/478,434, Frick et al., filed Jan. 6, 2000. U.S. patent application Ser. No. 09/755,346, Romo et al., filed Jan. 5, 2000.